Best Beauty Palettes & Sets — Anna Akbari, Ph.D.
Uncovering the world of quality makeup can be the start of a dangerous addiction. I’m sure that I’m not the only person who nearly gets heart palpitations from walking into a Sephora. There are just too many options to be truly satisfied, unless you’re prepared to drop a significant amount of cash. That’s why buying makeup palettes and beauty sets are great. They give you a significant sampling of different products in useful sizes at incomparable prices, and are often crafted with a certain look in mind, so it’s easy for you to achieve. They make wonderful gifts, as well. Here are some of my favorites on the shelves right now. Glinda & Theodora Palettes by Urban Decay Are you a good witch or bad witch? You’d better decide before you pick up one of these Oz-themed eyeshadow palettes by Urban Decay. When it comes to eyeshadow palettes, Urban Decay is essentially unbeatable. We’ve already featured their NAKED palette as one of our minimalist makeup must-haves. That’s because their formulas are highly pigmented, so the colors don’t get faded and dull two hours into your day. These new sets are limited-edition, promoting Disney’s Oz the Great and Powerful, and feature a set of colors for each: rosy plums and soft beiges for good witches, and harder coffees, popping mosses, and regal golds for the wicked. They also both feature a 24/7 Eyeshadow Pencil to complete the look – pretty purple for Glinda, basic black for Theodora. Too Faced’s Secret to “No Makeup” Makeup We all know the cardinal sin of everyday makeup: looking like you’re actually wearing makeup. 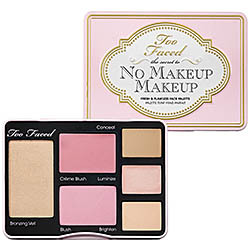 For a shortcut to that effortless beauty look, grab this Too Faced kit. It features a versatile concealer, both powder and crème blushes, and a light, “shimmer veil” bronzer – plus, two products you may not have heard of, a luminizer and a brightener. They’re about the consistency of concealer and can be applied to different parts of your face to accentuate light. If that sounds out of your league, the kit also includes a Glamour Guide with step-by-step diagrams that teach you how to apply the products for three different looks. It’s a great set for staying pretty-yet-subtle while traveling or working. Korres Goddess Glow C ollection Trying a new regimen when it comes to concealers, powders, and primers can be anxiety-producing. They’re often the biggest investment you make when you go makeup shopping, and if facial makeup is wrong, everything else is wrong. That’s one reason why picking up sets – which have smaller sizes – is a good idea. In this case, however, you’ll wish you’d have bought more. The texture of Korres products is so smooth and immediately feels hydrating on the skin, but does the job of providing coverage. They’re also formulated with anti-aging, skin-renewing quercetin and oak, and without parabens, silicone, or sulfates. If you’ve already got a primer and face routine you love, I’d still recommend checking out their Korres Butter Indulgences set, filled with lip and cheek butters to add a flattering touch of color to your lips and cheeks while still hydrating your skin. Smashbox Try It Kit Sometimes “themed” beauty sets are wonderful – they give you several solid looks to practice remaking, or they step you out of your comfort zone by mixing fun and practical colors. Sometimes, though, you just want the most bang for your buck, and the best combination of products you can use for your entire face. 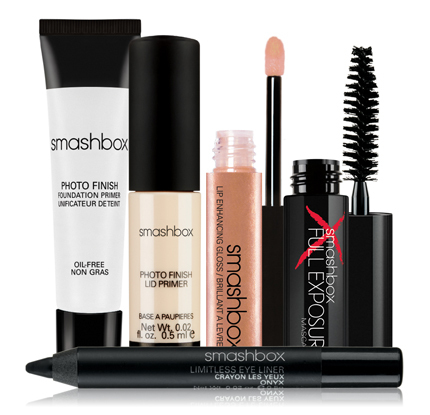 That’s exactly what Smashbox has done with this “Try It Kit.” They’ve featured their bestselling products for every part of your face: primers for your face and lids, mascara, eyeliner, and gloss, all in compact sizes. It’s a perfect set to pick up and immediately throw in your travel bag. Stila Lip Glaze Trio Another great benefit of buying your makeup in palettes is that you can get great deals on a product you already love. That’s the case with this set of Stila’s infamous lip glazes. If you’re not familiar with them, they’re basically the grown up version of lip gloss – perfect for adding shine to a shade of lipstick that’s too matte, or adding a low-key colored sheen to your natural lip. This set features three floral shades of peach, pink, and plum for a seriously unbeatable $12 steal.